First, there’s something fundamental about that number. Never mind that by adding together the integers from 2 to 7 one gets 27. Nor that it is the number of books in the New Testament or bones in the human hand. For my allusion is, of course, to Oscar Wilde. Don’t panic, neither do I intend to bore you with similar trivia by noting how C.3.3. (Wilde’s prison number) is like the perfect Cube 33 and three cubed also comes to 27—although someone does need to explain why when Ellmann says, “Mahaffy boasted he had taught Wilde the conversational art”; and David Friedman in Wilde in America says, “if Mahaffy had convinced him of anything, it was the power of good talk”; and The Wilde Album says that Oscar described Mahaffy as “a delightful talker, too, a really great talker”—that all of these identical references occur on page 27 of their respective books. No, let us move from meagre pettiness to meaningful purpose. Or at least as meaningful as can be mustered as I write this blog within the heady hospitality of the Oscar Wilde Bar in New York City, which I can blame for all of this numerology: it is, needless to say, on 27th Street. My current focus is the famous collection of Sarony photographs of Oscar Wilde and with them the anomaly that the highest number in the series is twenty-seven. Accordingly, it is often cited that there 27 Sarony photographs of Oscar Wilde from 1882. And that record includes anyone who had better things to do than count photographs, and the story goes all the way back to and including the Sarony Studios and probably Oscar himself. The problem arises with these two photographs included in my archive as photographs 9A and 9B. They are extremely similar and could easily be mistaken for one another when not viewed together. And it appears that this is precisely what most people have done. Even the Sarony Studio inscribed a number 9 on both of them. 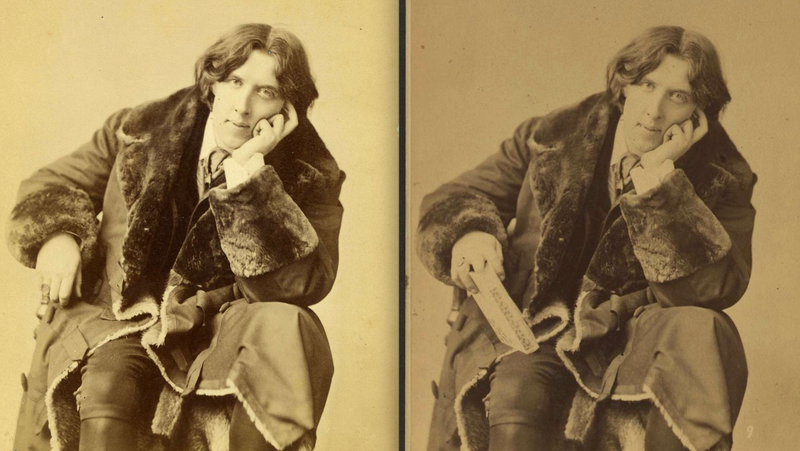 However, when juxtaposed one can easily see that the photos are different: in one Wilde is holding his book of Poems (1881) and in the other he is not. Any suspicion that the two number 9s are actually the same photograph doctored (which was not unusual in Victorian times) can be dismissed because a close inspection shows differences in Wilde’s left hand—see the ‘Details’ at the foot of this page. The total of 27 thus persisted unchallenged by most, if not all, accounts of the Sarony session to date. And, although The Wilde Album (the only other place where the Sarony photos can be found as a group) omits the one with Wilde holding the book, the author was wise enough to note that there were “at least” 27 pictures. And, as if to bear out this caution, one contemporary report I have says that Wilde had “30 sittings” which would be a more understandable number. It seems a little beyond coincidental for Wilde to use a total of twenty-seven in connection with a random number of photographs in a conversation with no plot value. Interesting, too, that Dorian questions the number twenty-seven, again for no apparent reason other than to have it changed to twenty-six, just as Wilde had done for the New York press. Finally, and to complete the exchange, consider that the Sarony photographs were taken on January 5, 1882, the very night Wilde attended the Standard Theatre, in New York for a performance of the opera Patience. After all that, it’s a pity there are 28. The cute phraseology of this observation is credited to my Wildean friend Lily Rothenberg of New York. The facts are that Wilde was born in October 1854 and therefore was aged 27 in January 1882, not 26, as he told the press. (New York Evening Telegram, Jan 3, 1882, 1).
. At least three more Sarony pictures of Wilde with short hair were taken in 1883 making the total of 31 known Sarony images. Significantly, the inscribed numerals on the two versions of number 9 are in different styles suggesting two hands, which might explain the duplication. Page 27 of Mahaffy’s “The Principles of the Art of Conversation” states: “Of course to instruct or to be instructed is often very pleasant, and so far knowledge, general or special, is a very useful help to conversation”. Brilliant! That’s like out-Henleying Kipling. Robert Johnson, Brian Jones, Jimi Hendrix, Janis Joplin, Jim Morrison, Kurt Cobain, Pete Ham, Amy Winehouse, all died at the age of 27. Brilliant! Thanks for liking my blog post! If I ever get to New York I’ll head for the Oscar Wilde bar!